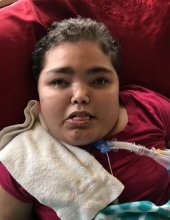 Miss Jessica Lynn Chavis of Maxton was born in Scotland County on November 26, 1987 to Thurman & Cindy Chavis and entered into her heavenly home on February 2, 2019 completing her journey of 31 years. She was preceded in death by her grandparents: James Thurman & Marie Chavis and Thurman Locklear; and one aunt: Doris Oxendine. The funeral will be Thursday, February 7, 2019 at 2:00 P.M. at Shoeheel Holiness Methodist Church with the Revs: Chester Chavis and Dwayne Lowery officiating. Burial will follow in the church cemetery. Miss Jessica leaves to cherish her memories her parents: Thurman & Cindy Chavis of the home; her brother: Kerwin (Brooke) Chavis of Fayetteville; her grandmother: Karby Locklear of Rowland: her aunts and uncles: Johnny and Shannon Locklear, Martha and David Barton, Daryl and Devin Chavis, James Ray and Leslie Chavis, Janetta Chavis, and Michael and Mary Locklear, all of Maxton, and Robby Locklear of Rowland; special cousins: Makayla, Katelin, Magan, and Daylon; four special caregivers: Michelle Brower, Natasha Brown, Tammy Sampson, and Loretta Lowery; and a host of family and friends. The family will receive friends from 6-8 P.M. on Wednesday, February 6, 2019 at Shoeheel Holiness Methodist Church. Services entrusted to Boles Funeral Home of Rowland. To send flowers or a remembrance gift to the family of Jessica Lynn Chavis, please visit our Tribute Store. "Email Address" would like to share the life celebration of Jessica Lynn Chavis. Click on the "link" to go to share a favorite memory or leave a condolence message for the family.